Monique Barker Traditional Technique Original Designs. Originally from France, Monique was trained in ceramic and design in Paris. 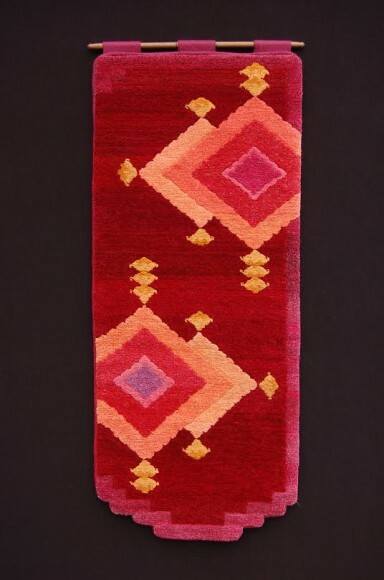 In 1986 she travelled to Nepal and studied pile rug techniques with a Tibetan master weaver. After a few weeks of practice she realized the beautiful simplicity of this ancient art. Monique creates one of a kind colorful tapestries on her Tibetan style loom. This process includes spinning and dying wool yarns, searching new designs, and setting up my loom ready to weave. Mask making is Monique’s other creative medium, made with Celluclay. The masks were first inspired by ceremonial Tibetan mask, but became a reflection of her own story. Monique says her best masks are the most surprising and unexpected. 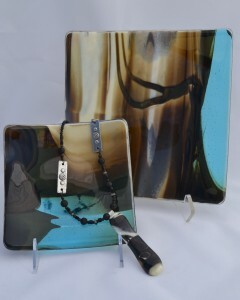 Debbie Earley Fused Glass. Debbie began fusing glass in 2001 and had the privilege of studying with many top people in the world of glass fusing. Debbie makes jewelry, functional food safe bowls and plates, as well as large wall pieces. Debbie’s current work leans toward more ‘organic’ pieces with inclusions of paper, metals, and intentional bubbles. She likes to experiment with the chemical reactions that can occur when combining two or more colors of glass. While glass fusing is actually an ancient art form, the advances in science and technology have given us many wonderful new products such as dichroic glass and computer-controlled kilns. With everything that is available to today’s glass artist, the possibilities are almost limitless. Connie Simonsen Hand-dyed Silk Scarves and Shawls. Connie is crazy about Silk! She loves the intensity of color she gets from steam-set dyes. 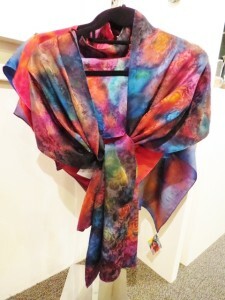 Steaming makes the colors permanent and vibrant – and the silk retains its sensual feel. This feeling is enhanced by the textures and thickness (momme) of silk fabric such as: crepe de chine, satin charmeuse, jacquard, habotai, or chiffon; each having its own unique character when responding to brush strokes. Nearly all of Connie’s inspiration comes from nature: sunsets, tidal pools, mountains, petrified wood, landscapes, flowers. Abstract painting helps Connie express her vision through color. 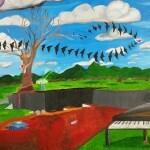 Crystal Tarbell is a 17-year-old artist, who primarily creates drawings and paintings. 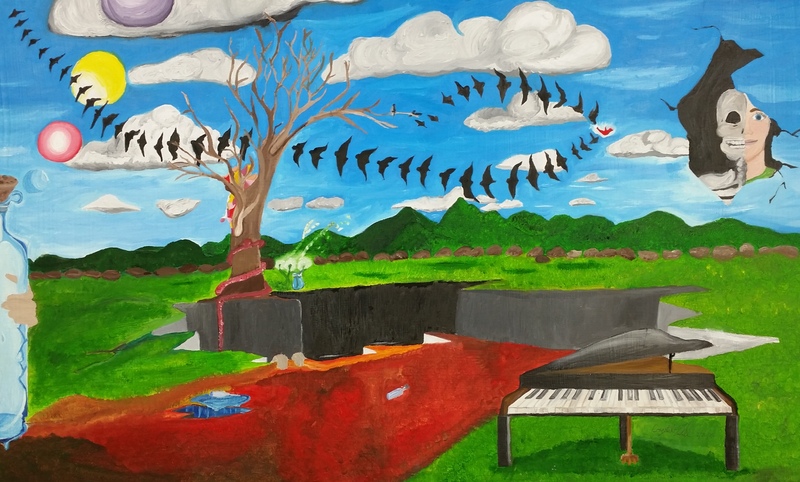 Her surrealistic and poetic works of art often reflect her inner life and past experiences, which include being homeless and surviving on her own. Crystal is currently working with Maslow Project, Hearts with a Mission, and Water’s Edge Community Church on life goals, such as earning a high school diploma, gaining employment experience, and achieving housing stability. Crystal is very excited to have her first art show, which will help support her trip to Uganda this summer to work with orphaned children. 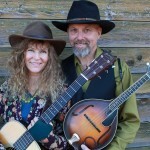 Blades of Grass is a bluegrass duo featuring Kathryn Casternovia on guitar & voice, and Jef Ramsey on mandolin & voice. 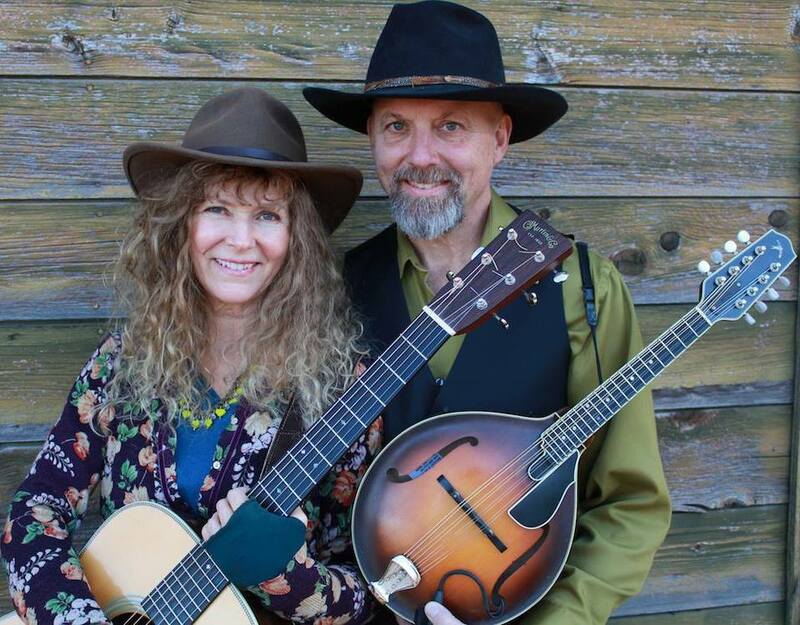 Performing at Ashland Art Works on Oak St, First Friday Art Walk, Friday, April 3, 2015, 6 pm.